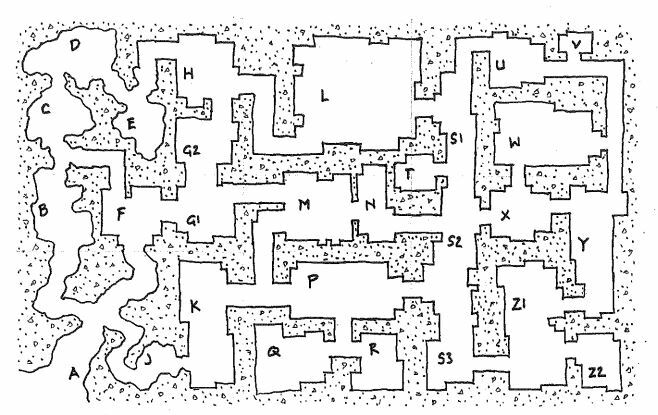 This is not a naturalistic cavern; the spacing and layout shows an obvious hierarchy of assembly of rooms and halls, even if the shape of the spaces and character of the walls are meant to suggest a cave instead of a straight-walled dungeon. Many niches and nooks and hidden areas in this warren provide ample opportunities for concealing important things, or for lying in wait for ambush. There’s something almost mind-breakingly meta about finding an article about saving orphaned RPGs by using the Wayback Machine, and searching through a blog that is itself now gone except for the archive. Rodger Thorm spots a Boing Boing post about copyright and points out the implications for RPGs. The US Copyright Office is looking into the need for a system to clear the rights for orphaned copyrighted works with no visible rightsholder. They want public comment, since they’re trying to figure out what the pros and cons are of various potential courses of action with regard to orphaned works. As Rodger points out, there’s a ton of this kind of thing in the RPG field. If you’re a creator or a fan of an orphaned RPG — not one that the rightsholders won’t publish, but one for which the rightsholders are unknown — it might be worth your while to submit a comment according to the process outlined. There’s also a reminder in there that I had another blog (now orphaned and forgotten; it’s a theme). I think that the few bits that were there got migrated elsewhere (perhaps the early tail of this one, in fact), but I should go back and see what was there. There are things about this one graphically that I like very much. A lot of these maps have come about from various kinds of graphic experimentation, and when one of them reads well, it’s always nice to see. This also shares some obvious similarities with the earlier Complex of Rooms. The question with these is whether it’s appealing and playable. I’d love to get your opinion, or even better, a play report if someone uses it for an adventure. This may be the next of the Un-Furnished Dungeon series. We’ve got an interesting idea to explore for that, a kind of unique format to put it in print. 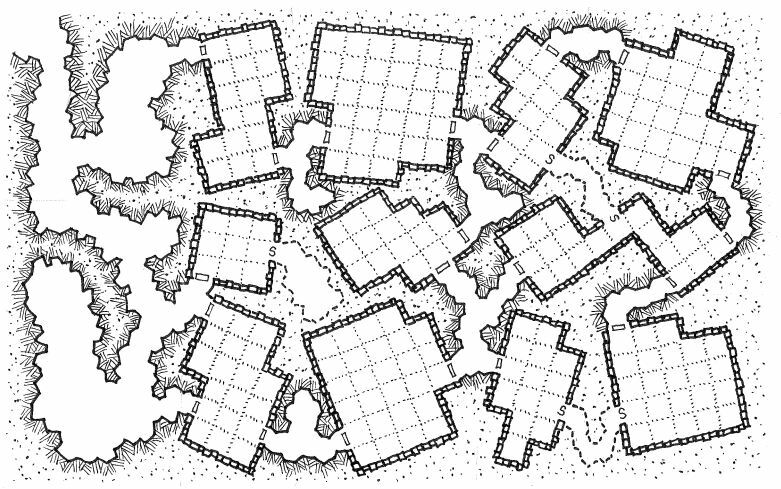 Without padding them further, it turns out that the Un-Furnished Dungeons are be too small to be able to put together as a DriveThruRPG product, at least as presently configured. We just don’t have the page count to make a whole book out of it. We could certainly do them as PDFs, and let people print them on their own. But, for now, we’re going to work on making relatively low-cost printed copies that can also be mailed relatively cheaply. The printed cards arrived along with some other things for proofing. The immediate question was, would they pass the pencil and pen test? Overall, they are pretty decent, as good quality as should be expected for something like this. The printing of the light grays is a little bit too light, but that’s a calibration issue between design and production, and that’s what print proofs are for. The more important question is the glossiness of the coating, and how well they can be written on. Since these are intended for note-keeping, it is important that these can be written on. By themselves, they are nothing, really. So, how did they do? The bad news, first of all, is that they are not at all suitable for use with pencils. I didn’t test it extensively, but the mechanical pencil I tried first did nothing other than creasing the surface a bit, the same as if I had been using a nail to mark it. So erasable doesn’t figure, since they can’t be written on with a pencil in the first place. If your writing implement of choice is a pencil, these cards are not what you want. Then I tried pens. I used four different pens on the test card (left, above). “But, I only see two sets of words, Rodger,” you’re saying, now. And that’s right. The Sharpies (both a Fine Point and an Ultra Fine) were perfectly adequate for marking these, and that’s what I used on the other cards shown, as well. The other two pens I used, a Flair Medium and a Micron 02 both wiped off completely (like a dry erase, almost), even after sitting on the card for a few minutes. So maybe there is some erasability, after all. That could be a good thing, or a bad thing, though. If you are using the card to keep track of something like charges used, or hit points received, you could probably re-use the card a couple times. The testing I did was to leave the ink on it for about 10 minutes before seeing if it would wipe off with a finger. After a few times doing this, it might not be as resilient as the first time. That’s not how they are intended to be used, so I wouldn’t want to count on them performing like that over and over. But they’re cheap enough you could use one for a while, and then, if it got messed up, just start a new one to replace it. 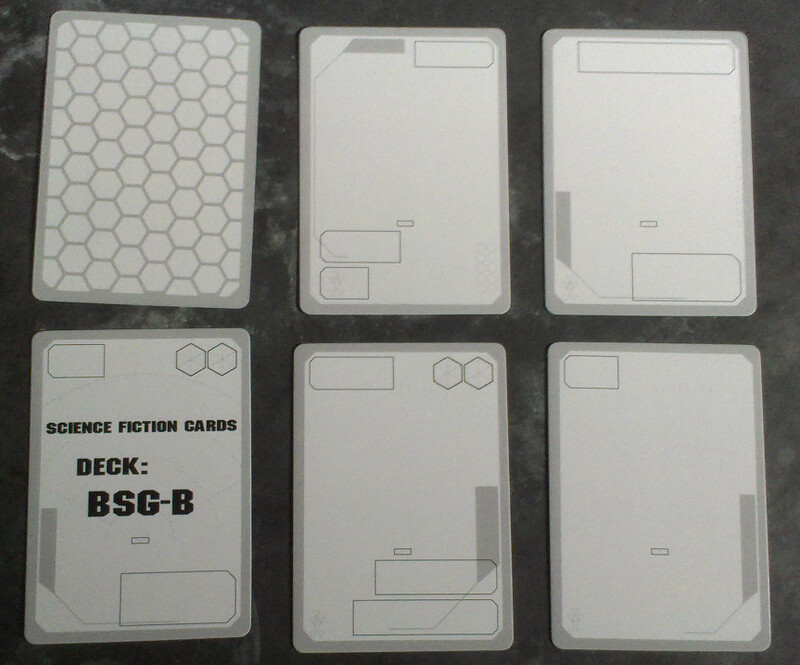 The scifi certificate cards were also in this order, as well. 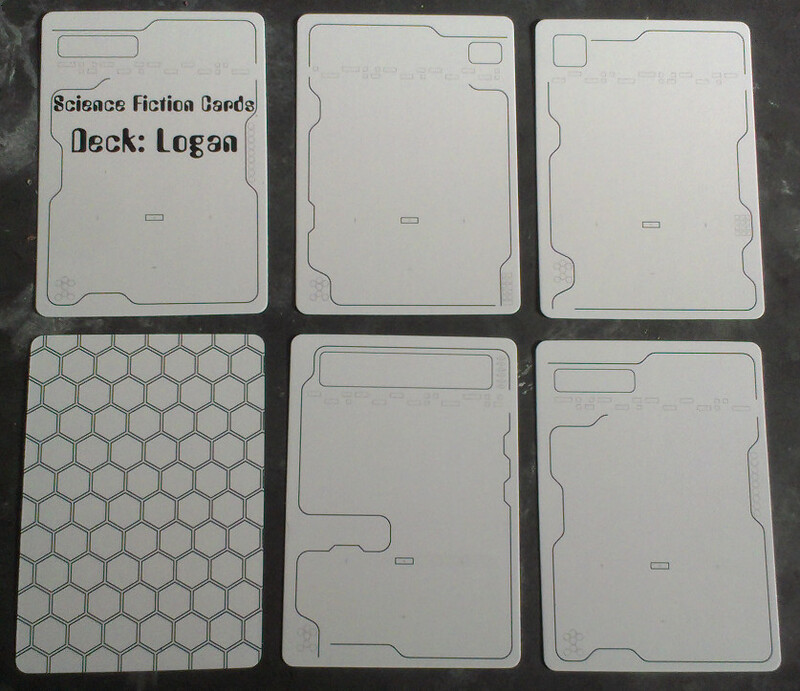 These are playing card size cards that you can use to keep notes for your games. Fill in info for special equipment, or use as a small scale character sheet. 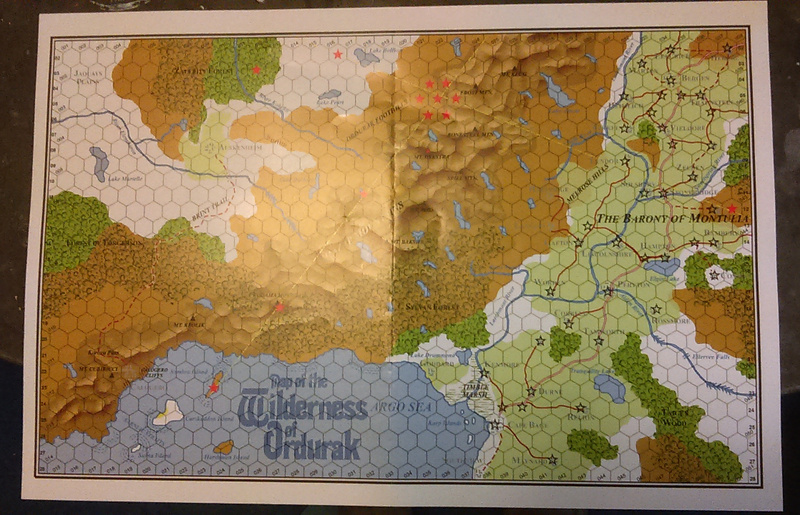 Card backs have a hex pattern, which can be used for mapping or other notes. What that the hatching looks like, up close. The most recently posted set of geomorphs were scanned at a pretty decent resolution, so it’s possible to enlarge things to see the detail. Whether that’s for better or for worse, I’m not sure. Hatch and other fine detail is done with a Sakura Micron 02 pen. Wall edges and other detail with a Paper Mate Flair M. Water is Prismacolor – True Blue. 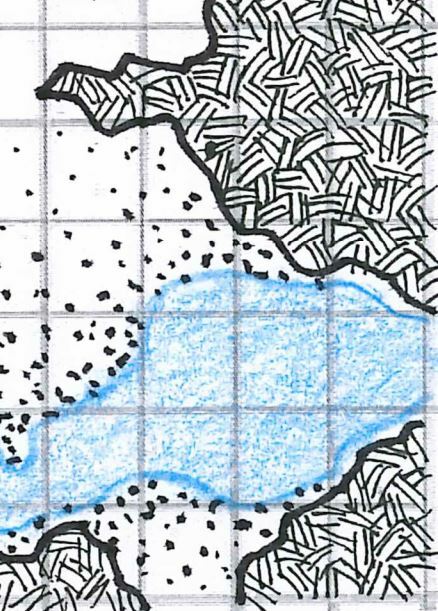 Three geomorph maps with the ‘water’ theme for Inked Adventures. Water has to go through passages, as well, and so it seemed reasonable to me to have some of the passages with water, instead of making a separate watercourse. You could connect these together, and have a stream flowing through a dungeon, where the footing is treacherous and crossing the water is a peril in and of itself. Or you could read it as just some slightly flooded passageways with some water on the floor. 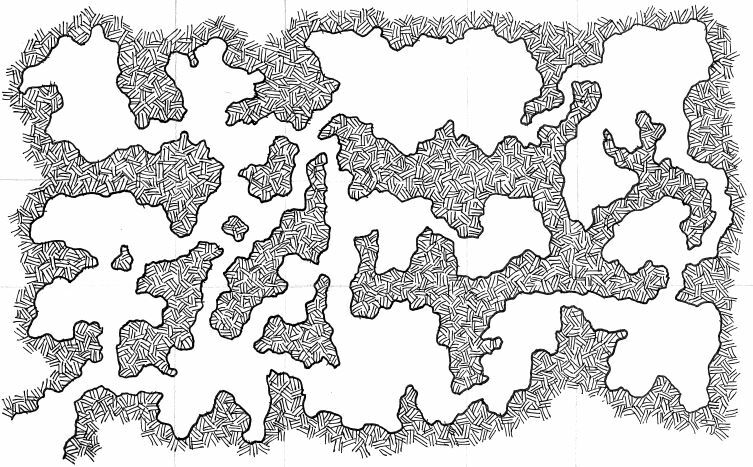 Further explorations in the orthogonal but not square school of dungeon-building. Also, not recommended for practitioners of the “I’ll describe it in words and then you try to draw it” method. Like some other people have said about their process, I generally draw these as straight to ink, without penciling anything in (not always, but often). I also have frequently been laying out a guide grid that divides my page into a few sections. You can see the effect of that on this complex in the two column sections (H, G2, G1, K on the left and S1, S2, S3 on the right). Having some organization in place helps keep these from becoming too scattered, and gives me something more to think about than merely a blank sheet of paper, which can always be a daunting thing to work from.